Since our last trip to The Animal Resort in Singapore, we had been thinking about farms. During our last holiday in Gold Coast, we had a stopover at Paradise Country @ Gold Coast . We did not blog about it due to an unexpected family event . 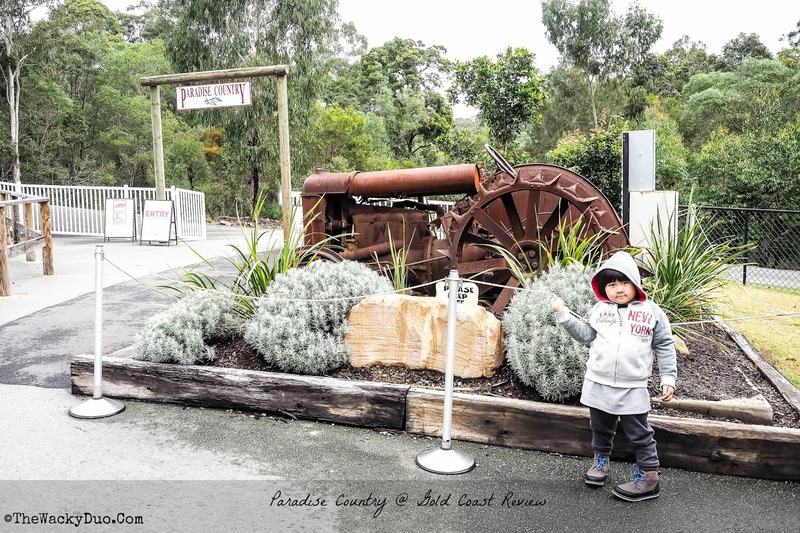 After our latest encounter with farm animals, we decided to document our trip at Paradise Country and give you a glimpse of what to expect if you choose to visit Paradise Country. As this is the school holiday, this guide might come in handy for those who are visiting Gold Coast. Never been to a farm? Paradise Country will bring you close to a farm in it's natural setting. Nestled on the same stretch of road as Movieworld. A visit there will be a good additional to the thrills and spills of the next door neighbours. We reckon a half day visit should suffice for a day out at Paradise Country. The farm shows were a hit at Paradise Country. Watch a sheepdog in action and learn how to milk a cow. Boomerang man was also on site to show you how a bommerang works! After the performances, you can get up close to the 'performers' and take a photo or two. Most of the photo taking are free, but you do need to pay extra for a photo with the Koalas. Another highlight of the trip would be to feed the Kangeroos. Compared to Curumbin Wildlife Sanctuary, there were less kangeroos to feed. Still it was fun for kids ( and adults) to feed them. After the big animals , it is time to visit the smaller ones. We almost miss this part, but we were glad to find it. The animal nursery would be a hit with the kids. Other activities include looking for gold or digging for opal in an opal mine. The boys did the latter. We headed down to a mini mine and chip away at designated spot for opals. The activity was over in 10 minutes. We were very sure actual opal mining will take a much longer time than this. At the end of it we got ourselves a certificate and some opals to take home. The extra activities do cost extra and was not part of the entrance fee. Paradise Country would be a good day trip for urbanites like us. Paradise Country is a little far from Singapore. 6153 km to be exact. However if you are in Gold Coast for holiday, you might like to make a detour there.